Our First 1-Outer: Nice Hand, Sir, Well Played! 45 Person $5 SNG, early on. Reads? Pfff. It's a $5 game. 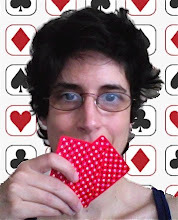 Cardgrrl had K , K (two pair, Kings and fours). CO had J , 7 (straight, Jack high). Okay, maybe I shouldn't have pushed the turn. But he called a big raise preflop and then called off most of his stack on the flop with a gutshot straight draw! Okay, pop on over to 2+2 and read this story. I have to confess that I laughed out loud. It makes my experience with J2 look pretty mild. Background - my local cash game. $200 - $500 buy in NL Hold'em with $5/$5 blinds. Full ring. I'm in BB with $1,200. There are lots of limpers (six?) and I check with an off suit Ad10c. Flop comes 10h 10d 7s. SB checks and I lead for the pot (my game involves extracting value with made hands - no need to be tricky here as any number of hands call) two callers, including the button. Turn is the 7d. I figure at this stage the best I can hope for is a chop, but anyone with one seven is going to call me down so let's find out. I bet 2/3rds of the pot. One fold and button min raises me. Ok, I'm behind to 77, tied with the other 10 and miles in front of one 7 so let's find out - I push. He snap calls and when the 8 of diamonds comes on the river tables the 6d9d for a runner, runner straight flush. So, I offer this as my personal [best? worst? ~ ed.] bad beat as it involved two of the worst calls ever. He called the flop with a pair on the board larger than his hand and holding only a gutshot straight draw. I actually don't mind the min raise on the turn but then he calls off his entire stack with a turned non-nut flush draw while facing a double paired board. Anyway - Nice hand sir, well played. StrangeFish also notes that truly horrendous bad beats are not just about the cruel and statistically improbable way the cards fall, but about the spectacularly awful manner in which a Villain played them. This tale certainly ranks high by both measures, and sets a daunting standard for future tales of woe. Cardgrrl had Q , 8 (flush, Ace high). CO had K , J (full house, Jacks over Kings). GAH. Be careful what you wish for. OK, I'll give this a shot. I had one today—kind of a classic of the genre. Not extraordinary, mathematically speaking, but illustrative. Bally's, Vegas, $1/2 NLHE. I'm in big blind (Seat 1) with 9c-9d. Seat 4 limps. Seat 5 makes it $10. Seat 7 calls. Seat 8 calls. I call. Seat 4 calls. Pot is about $45 after $5 rake. Flop is 9h-7c-2c, giving me the nuts. I check, highly confident that there will be a bet and at least one call, allowing me to trap some money with a check-raise. Sure enough, Seat 5 bets $15 after Seat 4 checks. Seat 7 calls. Seat 8 calls. I push it to $50. Everybody folds except Seat 8, who calls. He is the newest at the table, having arrived only a few hands before, so I know nothing about him except that (1) he came from a limit game and most of his chip stacks are still white $1 chips, and (2) he's wearing a PokerStars jersey. Pot is now about $175. Turn is an offsuit 5. I ask for a count of Seat 8's chips. He has $129 left. I have him covered and move all-in. He takes less than two seconds to call. I show my hand. He shows Kc-Jc. River: 6c. Flush gets there. I lose. He had to call $129 to win about $304 ($175 already in the pot plus the $129 I pushed into it on the turn), giving him about 2.4:1 pot odds, with no additional implied pot odds if he hit. I had one club, so, though he didn't know it, there were only 8 of them left, and two of those would pair the board, giving me a full house. So he had one pull at 6 outs. Odds against hitting 38:6, or 6.3:1 against. In other words, he was willing to pay nearly three times what he should have seen as the break-even price to draw. So, once upon a time I said I would never tell a bad beat story again. EVAR. That was a foolish promise. I play poker; of course I'm going to tell bad stories. Only a person of superhuman qualities and extraordinary virtue could play as much poker as I do and never tell a bad beat story. And neither descriptor applies to me. On the other hand, I can keep the bad beat stories from cluttering up my main blog Raise or Fold. And, perhaps I can perform a public service to other seething poker players in the process. If I deem your tale of woe worthy, I will promote it to a full post entry. The only catch is that it will then be fair game for commentary from my sharp-tongued readers, who will analyze the hand to within an inch of its life and tell you exactly what you did wrong to deserve the beat you horrible donkey, you. If that possibility does not discourage you, share away! I may also link to particularly atrocious beats when I come across them on the interwebs. Feel free to share such links in the comments as well.